Demitri is a film director and new media artist based in Athens. His work is characterised by a mixture of live action and digital animation. He is working as a commercials director in Greece. In his personal work he has extensively experimented with new media, especially in relation to film, www.delinikolas.com. He studied Animation followed by a Masters in Film Directing in the UK, and a second MA in Digital Art forms in the Athens School of Fine Arts. 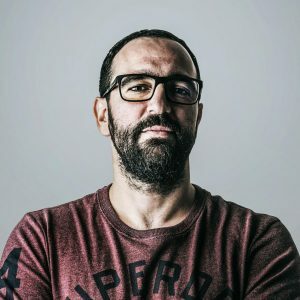 He has worked as a VFX artist and instructor in Greece and the UK. He is currently a PhD candidate in the University of Athens researching the application of the web in the production and distribution of digital cinema. His short films and documentaries have been screened and awarded in festivals worldwide, such as Clermont Ferrand, Bristol Encounters, Seoul Youth Film Festival. He has founded the collective www.emptyfilm.comhttp://www.emptyfilm.com, which focuses on the creation of new media and trans-media projects.